Contact us to purchase Glass Volumetric Flask that is one of the extensively used Laboratory Supplies. Understanding the significance of Glass Volumetric Flask for conducting experiments, etc., we bring forth the finest Glass Volumetric Flasks that conform to the requisite quality standards and norms. The Laboratory Volumetric Flasks can be purchased in bulk from us. We are a renowned name as Glass Volumetric Flask Manufacturer, Exporter and Supplier from Pondicherry, India. 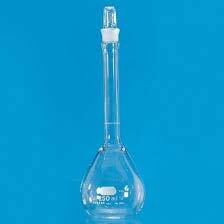 A volumetric flask (measuring flask or graduated flask) is a piece of laboratory glassware, a type of laboratory flask, calibrated to contain a precise volume at a particular temperature. Volumetric flasks are used for precise dilutions and preparation of standard solutions. These flasks are usually pear-shaped, with a flat bottom, and made of glass. The flask's mouth is either furnished with a plastic snap/screw cap or fitted with a joint to accommodate a PTFE or glass stopper. The neck of the volumetric flasks is elongated and narrow with an etched ring graduation marking. The marking indicates the volume of liquid contained when filled up to that point. The flask's label also indicates the nominal volume, tolerance, precision class, relevant manufacturing standard and the manufacturer’s logo. The volumetric flasks are of various sizes, containing from 1 to 20 000 mL of liquid.